I spent last weekend in Brussels and Lorenzo asked me to write some lines for his blog. Brussels is an interesting city, ugly yet beautiful at the same time. It is fascinating how a city which embodies the great European dream can be so depressing – at least, the new European part looks depressing. No statues of liberty in this city welcoming new people. Literary terms occurred in my head: Brussels seems like a weird paradox to me. Its exterior can be seen as some kind of awkward metaphor for today´s situation of the EU, as viewed by many people: the old part I found quite beautiful, while the new buildings taking over the city looked threatening. Sometimes, content is not enough – it should be expressed in tangible objects to make a strong case. Inspiring architecture would be a good start. even hiking on a highway after taking some wrong turns is fun. Translation in the EU’s headquarters is an extremely costly business. I have been to conferences with less than 20 participants and yet 23 translators at work. This comes at an incredibly high price. Not to mention the costs of written translations. It is estimated that the EU produces 1.76m pages of translation work a year, costing €300m (£257m). So why not save billions and make English, or French, or German the Union’s official language? Unfortunately, the price would be a loss of democracy and integration, not to mention a the problems with political equilibrium and representation. How about alternative solutions? A proposal to make Latin the official working language is an old April fool, but some people suggest Esperanto as a fairer lingua franca than English. Others have experimented “Europanto”, a freestyle mash-up language made up of the common body of European languages, without grammar rules and an unlimited vocabulary. Europanto is a joke, of course, but, as reported by the Guardian, it may carry a serious message. Imposing a common European language may be a political impossibility, but that’s not to say that such a language won’t develop naturally in the long run. Last year a frustrated senior translator at the European court of auditors compiled a 33-page document on commonly misused English phrases in EU publications (“to precise” meaning “to summarise” for example, or “actors” to mean “people or organisations involved in doing something” rather than “performer on a stage”). Eurospeak may not sound pretty to native English ears, but it may just be a lingua franca forming in front of our eyes. Being in Brussels I have grown sick of the non-sense of many Eurocrats who talk about smart growth, inclusion, targeted measures, ecosystems, boosting productivity. This means nothing in practice. But obviously most of the people, even the young people, fall into the trap. It looks like a bubble where people gave up critical thinking. My advice is to listen mainly to the Brits and the entrepreneurs, who seem to be the only ones who are able to avoid catchwords and silly non-sense by talking about very practical, very concrete, very immediate facts. After one intense week in Trento I’m now back in Brussels. Straight into the proper European mood thanks to this week’s Kal’s timely cartoon. Almost half of the people working for the EU are women. It must be said that the persons who sit on top of all the institutions are men. But women do already have a fundamental role and you see a lot of them walking in the streets busy while talking on their mobile phones. I realized this is something is really notice. It should be natural that way, but unfortunately it is not, especially if you come from Italy. Public confidence in the European Union has fallen to historically low levels in the six biggest EU countries. 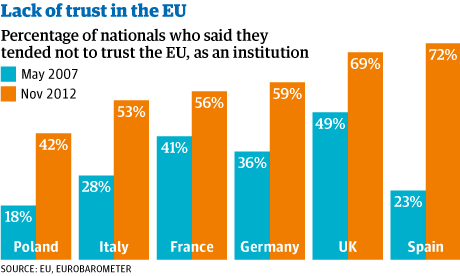 Figures from Eurobarometer, the EU’s polling organisation, show that Euroscepticism is soaring to a degree that is likely to feed populist anti-EU politics and frustrate European leaders’ efforts to arrest the collapse in support for their project. I came back to Brussels about one month ago. In this time frame I have had the chance to attend about 15 conferences. There are some recurring facts about them that I find quite interesting. First: vagueness. It is very rare to hear EU bureaucrats speaking about facts, figures, and policies. They tend to deliver rather abstract speeches about growth, solidarity, innovation, smartness… This is not always the case, but quite often. Instead, those who are really interesting to listen to are the people working for think tanks and, perhaps worryingly, those who are British. Journalists, commentators, and even politicians from the UK are often very provocative: sometimes for the bad reasons, but always with a clear, round, and very practical point. There are a few of other details which I find quite telling. Speaking about European bureaucrats, it has become almost impossible to go to a conference without hearing them using the expression “food for thought“. This is the perfect imagine of what is going wrong with the EU: the expression means nothing but sounds fancy, therefore people use it, therefore even more people will use it because it is becoming trendy as well. Finally, one remark on timing. All the conferences begin perfectly in time and they end at the exact time that was foreseen on the program. The only exception is with the conferences organized by Italian regions, Italian delegates, Italian cultural centers, etc: these events always begin with a 20-minute delay and rarely end in due time. Thanks to Leila for the message!